Here's the Leviton residential and commercial electric car charging products information I promised you last time! 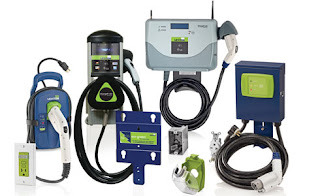 Leviton offers a complete solution for residential, commercial and public plug-in electric vehicle (PEV) charging: the Evr-Green™ line of electrical vehicle supply equipment (EVSE). Evr-Green products are compliant with all industry standards and compatible with all major auto manufacturers’ electric vehicles (SAE J1772 compliant). The line will include Level 1 and Level 2 residential charging products. These levels are defined by industry specifications with each level up representing a solution of higher amperage/voltage which reduces overall charging time. The Leviton Certified Evr-Green Installer Program builds on a contractor's experience and knowledge to ensure a quality installation of Leviton evr-green electric vehicle charging equipment. Program members are experts in their field and adhere to the highest levels of professionalism and workmanship. Offering free estimates, a warranty on workmanship and proof of being bonded and insured is a prerequisite of being included in this select group of qualified electricians/contractors.